Oral cancer is diagnosed in almost 50,000 Americans each year and has a 57 percent survivability rate past five years, according to research from the Oral Cancer Foundation. The number of diagnoses has been fairly constant in oral and pharyngeal cancer for decades, but survivability has actually gone up slightly in the last 10 years. This can be attributed to the increasing percentage of patients with dental insurance attending annual appointments (when oral cancer is most often recognized and diagnosed earlier), the spread of HPV-related oral cancer (which is easier to treat) and advances in diagnostic tools for dentists and oral specialists. These advancements aren’t limited to recognizing oral and throat cancer; strides in scientific approaches for surgical treatment are changing the way specialists treat oral phalangeal cancers. 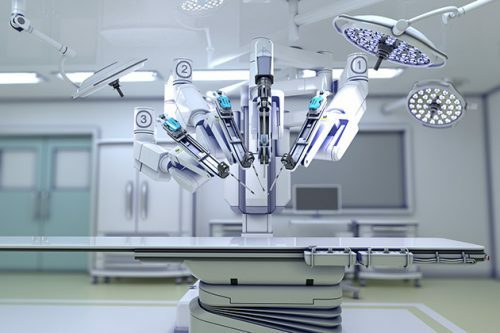 For example, Nepean Hospital of New South Wales has seen drastic improvement in patients’ quality of life and surgical recovery time by performing transoral robotic surgery (TORS) with the da Vinci System. This technology provides surgeons the tools needed to perform successful, minimally-invasive surgeries for patients with T1 or T2 throat cancers. “Without the robot, tongue and throat cancers are among the most difficult tumors to surgically remove,” said Dr. Chin, an otolaryngology, head and neck surgeon at the hospital. Previous surgical methods required surgeons cut into the neck to access tumors in the throat and back of the mouth — and operations would often last for up to 12 hours at a time. This caused permanent scarring and required recovery time in ICU and months of physical or occupational therapy for patients to learn to talk and eat again. TORS grants surgeons the ability to operate intraorally, reducing time spent on the operating table down to merely 45 minutes. Surgeons get a 3-D view of the tumor and a high-definition picture of the mouth and throat with this high-tech equipment — this also greatly reduces the likelihood parts of a tumor go unseen and remain in the body post-surgery. A surgeon, who stays in control of the robot 100 percent of the time, then uses instruments on his or her own wrists to guide the robot during each step of the surgery. The TORS rotation is also far greater than that of a human wrist — granting the ability to access parts of the patient’s throat previously unreachable with conventional surgery. As noted in Dentistry Today, this minimally-invasive technique has patients eating within 24 hours and cuts recovery time in the hospital from weeks to two days. Patients are able to maintain their independence post-surgery. This is revolutionary for older patients, for whom complicated surgeries often cause a decrease in their overall quality of life. As more surgical practices obtain this valuable technology, oral and dental specialists expect to see more improvements in survivability rates for patients with pharyngeal and oral cancers. At just 47-years-old, Tim Allsopp is battling throat cancer. He doesn’t smoke but during he’s his treatment, he says, he’s been exposed to second-hand cigarette smoke more often because he often passes by people smoking on his way to treatment at Calgary’s Tom Baker Cancer Centre. While AHS has had a smoke-free hospital grounds policy for years, it doesn’t take long to spot people lighting up. AHS says it tries to enforce its policy, but it’s not easy. “Our protective services people try to use an educational approach first but if that’s not successful, then they have the power to issue a ticket,” said Dr. Brent Friesen, lead medical officer of health for Alberta Health Services’ tobacco reduction strategy. Friesen says the problem is that AHS can only issue tickets for people breaking either provincial law or city by-law, not AHS policy. That means, while AHS may say no smoking is allowed on hospital grounds, the province only requires people keep a five-metre distance from hospital doors. It’s a similar situation for hospitals across the country. Provincial rules in B.C. require smokers keep a distance of six metres from hospital entrance ways, in Winnipeg eight metres is required and Ontario and Quebec require nine metres between hospital doors and anyone lighting up. Next year, however, Ontario will become the first province to ban smoking entirely on hospital grounds. Anyone caught violating the rule could face a $1,000 fine. Friesen says Alberta Health Services would like Alberta’s provincial government to follow Ontario’s lead but Alberta health minister, Sarah Hoffman, says patients who are addicted to nicotine deserve compassion as well. In a better world, the FDA would regulate homeopathic products. It would certainly be a lot cheaper and just as effective. Homeopathic products are big business, grossing at least $3 billion a year. A 2007 survey estimated that 3.9 million adults and 910,000 children used them. These figures have only increased during the past 10 years. Manufacturers are not required to submit a new drug application before selling them. Manufacturers are exempt from meeting Good Manufacturing Product (GMP) standards. Manufacturers are exempt from finished-product testing for identity and strength. And, as an added bonus, homeopathic products are allowed to contain higher amounts of alcohol than other drugs. Because no one is looking, poorly made and dangerous products slip through. In 2012, for example, 10,000 cases of “poison exposures” were reported; most occurred in children who were less than five years old and some required medical treatment. For these and other reasons, the FDA held a meeting on April 20 and 21, 2015, to discuss the regulation of homeopathic products. The FDA sought “written comments from all interested parties, including, but not limited to, consumers, patients, caregivers, health care professionals, patient groups, and industry.” With so many competing interests in the room, it shouldn’t be surprising that nothing happened. Nonetheless, about a year and a half after the FDA meeting, on Nov. 15, 2016, the Federal Trade Commission (FTC) took a stand, declaring that homeopathic products cannot include claims of effectiveness without competent and reliable scientific evidence. If no evidence existed (which is always the case), this fact must be clearly stated on the label. In order to understand homeopathic products and the controversies that surround them, we need to go back to the beginning. Homeopathy was the creation of Samuel Hahnemann, who practiced in Germany and France between 1779 and 1843. Hahnemann was disturbed by the brutality of 19th-century medicine, which included bloodletting, leeches, emetics, cathartics, and skin blistering with acids. He wanted a safer, better way to treat his patients. To understand how homeopathic products are made, let’s look at one popular product made by Boiron, a French company that describes itself as a “world leader in homeopathic medicines.” The product is called Oscillococcinum. Boiron makes Oscillococcinum by homogenizing the heart and liver of a Burberry duck, diluting it in water 100-fold, and then repeating the hundred-fold dilution 200 more times. A solution this dilute doesn’t contain a single molecule of the Burberry duck. In fact, the preparation is so dilute that not a single molecule of the duck would be found if the final volume were that of the universe (about 1080 cubic meters). The duck is gone. From a scientist’s standpoint, Oscillococcinum is one gram of sugar. Nonetheless, a pack containing six “doses” of Oscillococcinum costs $8.00. So it’s really expensive sugar. Promoters of Oscillococcinum argue that the product is of value if only because it’s a lot safer than other remedies out there, many of which are quite harmful. For example, some doctors will prescribe an antibiotic, like the all-too-conveniently-named Z-Pack, which contains azithromycin. Antibiotics can cause allergic responses or select for resistant bacteria. Worse, some parents will use over-the-counter cough-and-cold preparations. In 2007, the FDA issued a warning against these preparations in young children—a warning long overdue. Between 2004 and 2005, the CDC found that more than 1,500 young children had suffered hallucinations, seizures, and heart problems caused by cough-and-cold medicines containing stimulants like pseudoephedrine. Three children died as a result. Further, these products do little to relieve symptoms. Oscillococcinum, on the other hand, doesn’t cause any of these side effects. When people suffer adverse reactions to homeopathic products, like the poisonings referred to above, it’s because they aren’t really homeopathic. In other words, they might contain an active drug. Because homeopathic products aren’t regulated, consumers are on their own. The worst aspect of homeopathic products is when people use them to treat conditions that should be treated with real drugs, like antibiotics for bacterial infections or bronchodilators for asthma or steroids for severe eczema. Or, as was the case for a 45-year-old woman named Penelope Dingle in Australia, chemotherapy for a treatable cancer. Dingle paid for her choice with her life. In a better world, the FDA would regulate homeopathic products. Manufacturers would have to meet labeling and manufacturing standards and products would have to be proven to be safe and effective before they could be sold. If this happened, homeopathic products would disappear from the shelves. Then, patients or parents would have to use their own water or sugar to treat themselves and their children. It would certainly be a lot cheaper and consumers can be reassured that it would be just as effective. Paul A. Offit, MD, is director of the Vaccine Education Center at the Children’s Hospital of Philadelphia and the author of Do You Believe in Magic? The Sense and Nonsense of Alternative Medicine (HarperCollins, 2013). Teens are less likely to drink if they know that alcohol is a major cause of cancer, but most are unaware of the link, a South Australian study has found. More than 2800 school students aged 12-17 were surveyed about their drinking behaviour by Adelaide University and South Australian Health and Medical Research Institute (SAHMRI) researchers. Those aged 14-17 were deterred from drinking if they knew about the link between alcohol and cancer, but only 28 per cent of students were aware of the connection. Parental disapproval was another deterrent, while smoking and approval from friends resulted in higher rates of drinking. Most students had tried alcohol by age 16 and a third drank at least occasionally. Wealthy students were more likely to drink. Cancer Council SA chief executive Lincoln Size said there was clear evidence drinking caused cancers of the mouth, pharynx, larynx and oesophagus, as well as bowel cancer in men and breast cancer in women. It likely raised the risk of liver cancer and bowel cancer in women too. “Any level of alcohol consumption increases the risk of developing an alcohol-related cancer; the level of risk increases in line with the level of consumption,” he said. “This latest evidence highlights the need to educate young people about the consequences of alcohol consumption and for parents to demonstrate responsible drinking behaviour. Lead author Jacqueline Bowden, a behavioural scientist with both the uni and SAHMRI, said drinking patterns were often set in adolescence. “With alcohol contributing to four of the top five causes of death in young people, and a leading cause of cancer in our community, it’s important for us to better understand drinking behaviour among young people so we can help to prevent or delay it,” Ms Bowden said. “One of the major messages from our study is that parents have more influence on their teenagers’ decisions regarding alcohol than they probably realise. “Parental behaviour and attitudes towards alcohol really do make a difference, and can help prevent children from drinking at an early age. “Many parents believe providing their children with alcohol in the safe environment of their home teaches them to drink responsibly. “However, the weight of evidence suggests that this increases consumption, and is not recommended. The findings of the study, which was supported by Cancer Council SA and the State Government, have been published in the journal BMC Public Health. A decision not to vaccinate boys against a cancer-causing sexually transmitted infection has attracted fierce criticism. Reported cases of human papilloma virus (HPV) – thought to cause about 80% of cervical cancers – have fallen sharply since girls were given the vaccine. But the Joint Committee on Vaccination and Immunisation (JCVI) found little evidence to justify treating boys too. Critics said vaccinating boys could help reduce the risk still further. Across the UK, all girls aged 12-13 are offered HPV vaccination as part of the NHS childhood vaccination programme. Mary Ramsay, head of immunisation at Public Health England, said: “Evidence from around the world suggests that the risk of HPV infection in males is dramatically reduced by achieving high uptake of the HPV vaccine among girls. This initial recommendation by JCVI will now be subject to a public consultation and a final decision will be made in October. The British Dental Association said it would urge the committee to reconsider the evidence. Shirley Cramer of the Royal Society for Public Health said: “We are deeply disappointed by the JCVI’s decision today, which suggests that fundamental priorities are focused more on saving money than on saving lives. “Such a simple vaccination programme has the potential to make such a big impact on the public’s health on a national scale. 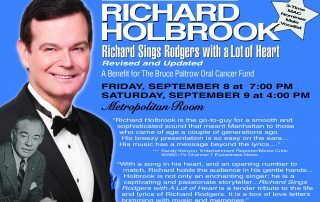 NEWPORT BEACH, Calif., July 13, 2017 /PRNewswire-USNewswire/ — Acclaimed cabaret singer Richard Holbrook will be performing two benefit concerts at the Metropolitan Room in New York City on Friday, September 8, 2017 at 7:00pm and Saturday, September 9, 2017 at 4:00pm as a benefit for The Bruce Paltrow Oral Cancer Fund which is connected with The Oral Cancer Foundation. Holbrook will be singing Richard Rodgers songs from classic Broadway shows and memorable Hollywood film musicals. “I’m so thrilled and excited to be performing my show as a benefit for the Bruce Paltrow Oral Cancer Fund,” he states. Holbrook will be accompanied by the fabulous Tom Nelson Trio. Born in New York City, Richard taught himself how to sing by listening to the recordings of Fred Astaire, Judy Garland, and Bing Crosby and by watching their films. He found success as an actor on such hit television series as The Sopranos and Spin City, and a passion for performing cabaret which led to his first CD entitled Richard Holbrook Steps Out in 2004. Over the past several years, Richard, a three-time MAC Award nominee for best male vocalist, has appeared at popular Manhattan night spots such as Danny’s Skylight Room, Don’t Tell Mama and of course the Metropolitan Room. This Flatiron “class act” aims to revive the “golden age of cabaret” as “up-and-coming stars” and “renowned performers” alike take the stage in an “intimate” room with “great acoustics”; run with “professionalism” by a “gracious staff”, it’s “worth every penny” for a “sophisticated” night out. – ZAGAT 2014. The Oral Cancer Foundation, founded by oral cancer survivor Brian R. Hill, is an IRS registered non-profit 501 (c) (3) public service charity that provides information, patient support, sponsorship of research, and advocacy related to this disease. Oral cancer is the largest group of those cancers that fall into the head and neck category. Common names for it include such things as mouth cancer, tongue cancer, head and neck cancer, and throat cancer. OCF maintains a web site at http://www.oralcancer.org, which receives millions of hits each month. Supporting the foundation’s goals is a scientific advisory board composed of leading cancer authorities from varied medical and dental specialties, and from prominent educational, treatment, and research institutions in the United States. The cancerous tumour growing at the back of Brian Hodge’s tongue was about as hard-to-reach as cancers get. The 73-year-old was told he’d need radical, invasive surgery to remove the 50¢-sized tumour. His surgeon would make an incision almost from ear-to-ear and split his jaw in two for the 10-12 hour surgery. After five days in intensive care, another three weeks in hospital and four to six months recovery, re-learning how to eat and talk Mr Hodge would have been left with disfiguring scars, and a voice that he may not recognise as his own. “My kids didn’t want me to have it,” Mr Hodge said. “But I’m not one to throw in the towel … Then the unbelievable happened,” he said. Mr Hodge became one of the first public patients to undergo robotic surgery for head, neck and throat cancer at Nepean Hospital, the state’s only hospital offering the service to patients who can’t afford private healthcare. Mr Hodge’s surgeon, Associate Professor Ronald Chin, performed the trans oral robotic surgery (TORS) by guiding the robot’s arm into his patient’s open mouth to remove the cancerous tumour. “I went in on Monday morning for the surgery and I was discharged Tuesday night,” Mr Hodge said of his surgery performed on June 19. “It’s just amazing. Two days compared to six months recovering. “What’s got me is that before it was only available to people who could pay the big money. I’ve worked all my life, I’ve paid tax and I think, why can’t we people get this surgery as well,” he said. TORS is available for private health patients in other NSW hospitals, but its use at a major tertiary hospital in Sydney’s west – surrounded by suburbs with some of the highest smoking rates and lowest private health insurance rates in Sydney – was significant. “It’s an enormous step forward to be able to offer this state-of-the-art treatment with such obvious benefits both cost-wise and [avoiding] disfigurement-wise … to patients who may not have previously had the resources to access it,” Dr Chin said. The da Vinci robot Dr Chin used was the same one Nepean Hospital’s urological surgeons use to perform prostatectomies on prostate cancers. The TORS procedure takes about 45 minutes. “Traditionally surgery is incredibly invasive. We had to make very large incisions across the neck, then lift the skin well above the lower lip and cut the jaw open,” said the otolaryngology, head and neck surgeon. “We’re talking about a massive operation. Then reconstruction is very difficult. “Not only did people face a horrendously long operation, they had to deal with long post-operative recovery and rehabilitation to regain speech, language, voice and the ability to eat and drink. “With TORS, patients can go home the next day [with minimal discomfort],” he said. More than 400,000 cases of oropharyngeal squamous cell carcinomas are diagnosed each year worldwide. The five-year survival rate for head and neck cancer in Australia is 69 per cent, according to government estimates. Nepean Hospital would see between 10 and 15 patients with head and neck cancers per year who would be suitable for TORS, Dr Chin said. The cancerous tumours, usually linked to smoking and excessive drinking as well as the human papilloma virus, were “extraordinarily difficult to access, almost impossible”, said Dr Chin. Robotic surgery costs significantly more than traditional surgeries. But Dr Chin said TORS could save the public health system up to $100,000 per procedure, where patients no longer needed to spend days in ICU, costing more than $3000 per night, or weeks in hospital. The robotic surgery is primarily indicated for patients with oropharyngeal carcinomas of up to four centimetres in size. Roughly one-third of TORS patients will not need chemo and radiotherapy. “The early evidence available on trans oral robotic surgery for oropharyngeal cancer is promising,” said Dr Tina Chen, medical and scientific adviser at the Cancer Institute NSW. “However, higher-quality research is needed to definitively say whether it means better clinical outcomes for patients, compared to other treatments already available,” she said. There was currently no high-quality evidence from randomised controlled trials comparing TORS to chemotherapy and radiotherapy for these types of cancers, a 2016 Cochrane review concluded. It noted “data are mounting”. Mr Hodge will soon be able to swap the pureed food he has eaten since the day after his surgery for his favourite meal, barbecue chicken, and the avid karaoke singer is already planning his first post-surgery crooning set-list. First, Engelbert Humperdinck’s Please Release Me, and the song he has been singing to his wife for decades, Anne Murray’s Could I Have This Dance. Smoking Scenes in Movies Have Increased … Why? After several years of decline, tobacco use depicted in movies is on the rise again. Does it matter? Where there’s smoke, there’s … probably a PG-13 rated movie. A new study shows that tobacco incidents depicted in top-grossing movies in the United States are once again on the rise, breaking an earlier decline. This is true despite public health efforts outside theaters to reduce smoking by children and teens. “If the progress that we had seen between 2005 and 2010 had continued, all of the youth-rated films would have been smoke-free in 2015,” said study author Stanton Glantz, PhD, professor of medicine, and director of the University of California San Francisco (UCSF) Center for Tobacco Control Research and Education. The July 7 study in the Centers for Disease Control and Prevention’s Morbidity and Mortality Weekly Report (MMWR) found that the total number of tobacco incidents in top-grossing movies increased 72 percent between 2010 and 2016. It also increased 43 percent in PG-13 movies. Tobacco incidents are defined as use or implied use, by an actor, of cigarettes, cigars, pipes, hookah, smokeless tobacco products, or electronic cigarettes. This increase comes as the number of movies showing tobacco declined — meaning fewer movies account for a greater number of tobacco scenes. In 2016, 41 percent of the top-grossing movies had tobacco incidents, down from 45 percent in 2010. In addition, 26 percent of youth-rated movies had tobacco incidents in 2016, a decline from 31 percent in 2010. Tobacco incidents in top-grossing movies peaked in 2005. The lowest number of tobacco incidents on record occurred in 1998. Tobacco depictions are now rare in PG and G movies — only four of these films in 2015 included tobacco use. The study was a collaboration between UCSF, the Centers for Disease Control and Prevention (CDC), and Breathe California of Sacramento-Emigrant Trails, which provided the data. Like on-screen violence, tobacco depicted in youth-rated movies can have a profound effect on children and teens. “It’s very concerning because five years ago in 2012 the surgeon general concluded that exposure to smoking on-screen in movies causes kids to start smoking,” Glantz told Healthline. There’s also a dose-response — the more often kids see tobacco use depicted in movies, the more likely they are to pick up the habit. According a National Cancer Institute (NCI) report, youths who are heavily exposed to smoking depicted in movies are two to three times more likely to start, compared with kids who have little exposure. “An increase in the amount of exposure means that more kids are going to be smoking and dying from tobacco-induced diseases,” said Glantz. Tobacco use is linked to lung cancer, mouth cancer, emphysema, and other diseases. The NCI report also cited studies showing that cigarette smoking in movies can influence adults’ and teens’ beliefs about smoking. For example, when stars are shown smoking, or when the health consequences of tobacco don’t show up in the film, viewers may develop pro-smoking beliefs and intentions. The increase in the number of on-screen tobacco incidents since 2010 runs counter to overall smoking trends in the United States. According to the CDC, overall smoking rates in adults have been falling for decades, and in high school students since the late 1990s. The researchers write that starting in 2001 public health officials became more concerned about tobacco use in movies. This might account for the decline of tobacco incidents in youth-rated movies between 2005 and 2010. So what has shifted in recent years? Some public health experts put the blame squarely on the motion picture companies that continue to produce youth movies depicting smoking. Currently, the Motion Picture Association of America (MPAA), which rates movies in the United States, has a smoking “rating descriptor” that is supposed to alert viewers and parents to tobacco use in a film. However, this descriptor was missing from 89 percent of top-grossing, youth-rated movies that depicted tobacco use, according to a 2015 report by the UCSF Center for Tobacco Control Research and Education. Public health experts are calling for a more consistent approach. A 2012 study in the journal Pediatrics estimated that this could reduce the number of teen smokers by 18 percent. A related CDC fact sheet estimated that this change would save the lives of a million youth. Advocacy group Smokefree Movies recently ran a two-page statement in The Hollywood Reporter and Variety demanding that MPAA update the rating system by June 1, 2018. The statement was signed by the American Academy of Pediatrics, the American Heart Association, and other health organizations. So far, the major studios have been unwilling to update the rating system to take into account on-screen tobacco use. Some health experts have proposed running anti-smoking messages before movies to counteract the effect of on-screen tobacco use. These are somewhat effective but would require much more effort than reducing children’s on-screen tobacco exposure. In contrast, patients assigned to investigator’s choice of treatment saw clinical meaningful declines, defined as a decrease in ≥10% from baseline, across 8 of 15 (53%) domains on the EORTC QLQ-C30 questionnaire. Investigators evaluated statistical differences in patient-reported adjusted mean changes from baseline between treatment groups as assessed by the EORTC QLQ-C30, EORTC QLQ-H&N35, and EQ-5D-3L at each time point, and the time to clinically meaningful deterioration per each individual scale’s criteria. Patient assessments were conducted before treatment initiation, at week 9, and then every 6 weeks during the treatment period using the EORTC QLQ-C30, EORTC QLQ-H&N35, and EQ-5D-3L questionnaires. Posttreatment assessments were made at follow-up visits 1 and 2 (35 days give or take 7 days after the last treatment dose, and 80 days give or take 7 days after follow-up visit 1). The EQ-5D-3L questionnaire was also administered at survival follow-up visits (every 3 months give or take 7 days after follow-up visit 2). Patients completed their assessments at each time point before physician contact, treatment dosing, or any procedures. Thirty-six patients assigned to investigator’s choice of treatment with platinum-based chemotherapy and 93 patients assigned to nivolumab completed 15 weeks of QoL assessment. Adjusted mean differences between the treatment groups were significant and clinically meaningful, defined as a difference of 10 points or greater, in favor of nivolumab for role functioning, social functioning, fatigue, dyspnea, and appetite loss at both weeks 9 and 15. Investigators also observed significant and clinically meaningful differences favoring nivolumab for diarrhea week 9, and at week 15 for physical functioning, cognitive functioning, and insomnia. Nivolumab significantly delayed median time to deterioration compared with investigator’s choice for pain, sensory problems, social contact problems, and mouth opening problems on the EORTC QLQ-H&N35 questionnaire. Patients in the nivolumab group reached median time to clinically meaningful increase in weight, but not in the investigator’s choice group. The EQ-5D VAS, a measure of the patient’s overall health status, was similar between groups at baseline for the analytical cohort (n = 124) and all-randomized population. However, patients in the nivolumab group had a clinically meaningful improvement, defined as a difference of ≥7 points, in adjusted mean change in VAS score from baseline to week 15 compared with clinically meaningful deterioration in the investigator’s choice group (7.3 vs -7.8). The difference between groups at week 15 favoring nivolumab was both significant and clinically meaningful. Median time to deterioration on the EQ-5D VAS was not significantly different between the treatment groups. CheckMate-141 was an international, phase III, randomized, open-label study investigating comparing overall survival (OS) with nivolumab versus single-agent therapy of investigator’s choice in patients with platinum-refractory recurrent or metastatic HNSCC. Patients were treated at 66 sites in 15 countries in North America, Asia, Europe, and South America. Patients with cancer of the oral cavity, pharynx, or larynx were randomly assigned to 3 mg/kg nivolumab every 2 weeks (n = 240) or investigator’s choice of cetuximab (12.4%), methotrexate (44.6%), or docetaxel (43%; N = 121). Cetuximab was administered at 400 mg/m2 for the first dose followed by 250 mg/m2 weekly. Methotrexate was administered at 40 mg/m2weekly. Docetaxel was administered at 30 mg/m2 weekly. Median age was 60 years, and 31.3% were ≥65 years of age. Most patients were male (83%), Caucasian (83%), and had an ECOG PS of 1 (78.4%). Most patients received ≥2 prior systemic therapies (54.8%), and over 90% had received prior radiation therapy. HPV status was known for 49.3% of patients, using p16 status, and PD-L1 expression was available for 72% of enrolled patients. The 1-year OS rates were 36% with nivolumab (95% CI, 28.5-43.4) compared with 16.6% for investigator’s choice (95% CI, 8.6-26.8). Similar improvements in survival were seen across demographic subgroups. The median progression-free survival (PFS) was 2.0 months with nivolumab versus 2.3 months with investigator’s choice (HR, 0.89; 95% CI, 0.70-1.10; P = .3236). The 6-year PFS rates were 19.7% for nivolumab and 9.9% for investigator’s choice of therapy. 1.Harrington KJ, Ferris RL, Blumenschein G, et al. Nivolumab versus standard, single-agent therapy of investigator’s choice in recurrent or metastatic squamous cell carcinoma of the head and neck (CheckMate 141): health-related quality-of-life results from a randomised, phase 3 trial [published online June 23, 2017]. Lancet Oncol. doi: 10.1016/S1470-2045(17)30421-7. 2.Ferris RL, Blumenschein GR, Fayette J, et al. Further evaluations of nivolumab (nivo) versus investigator’s choice (IC) chemotherapy for recurrent or metastatic (R/M) squamous cell carcinoma of the head and neck (SCCHN): CheckMate 141. J Clin Oncol. 2016;34 (suppl; abstr 6009). 3.Singer S. Quality of life after nivolumab treatment for head and neck cancer [published online June 23, 2017]. Lancet Oncol. doi: 10.1016/S1470-2045(17)30463-1.